Good friend/neighbor is there documenting it for the Village and has shared these with me, to share with you all. then tell this person and get them to enter it. Sure winner (with the b/w) compared to the last few winners. Brilliant. this is my favorite photo posted on this board, including my crappy stuff. Bravo Cliche. The bike pic galleries you and 58 have posted are stellar, many good shots have made their way here...I'll let my friend know. I took a lot of video of action...just not sure how I'd post...I guess my YouTube account no longer works. last one, decided to put one more here because I think this shows the scale well...last section going in today. Can the next TOLE pass through the tunnel? Those would make awesome pics! drove by 2 mornings ago. The size of the drilling utensil is enormous. Even with the photos above, it seemed much bigger in person. Wish I was able to see it in use. The size of the drilling utensil is enormous. In actuality, there was nothing to see really...it was quiet...and the most "action" was the removal of the bucket that filled with dirt...the coring was "hidden" and the only evidence was the dirt. The plan is to remove all that sheathing. I talked to the surveyors about this and neither I nor they understand why. Seems like this will only increase the chance of the tracks settling. Possibly. But they did inject a substance in all that gravel, dirt, ballast and muck that looked like some sort of plastic, and in a grid every couple of feet or so from both sides, before they began to bore through, to firm it all up first. Maybe that made it so solid that it is now stronger than ever before the corrugated steel went up. 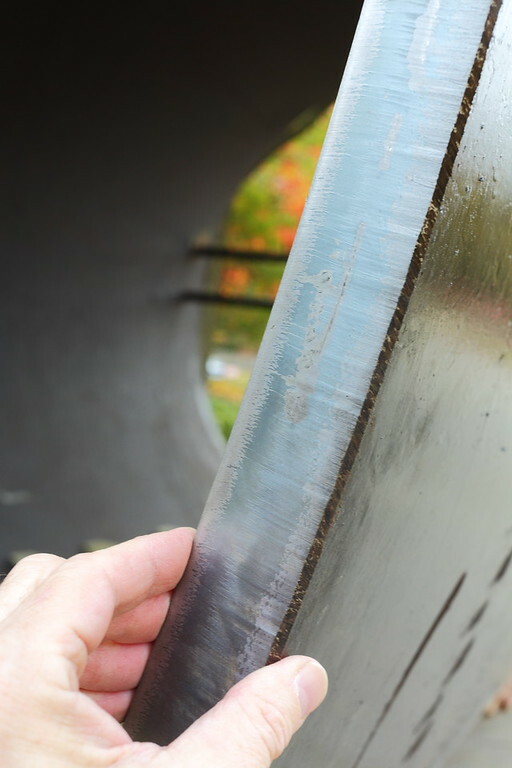 Then, those 1.5 inch thick tunnel sections are dang strong on their own too. That said, if anyone begins a pool whether the tracks will sag and derailments begin, I'm in for a couple of dollars. Safest of all places if that occurs would be within the new tunnel. Looks very tough. I tried pinching it, squeezing it and punching it, and it wouldn't give at all. Last edited by GESince1958; 11-13-2018 at 11:05 PM. The plan is to remove all that sheathing. I talked to the surveyors about this and neither I nor they understand why. Money. Sheet pile is expensive and they'll re-use it on their next project. Sheathing was always temporary and a minimal amount will actually stay. A permanent retaining wall will be installed, cast-in-place headwalls on either end of the tunnel. Once completed, the remaining pre-cast wall sections can be added on either side of the tunnel to form the permanent retaining wall system. As Cliche explains later in this thread, the sheeting they installed was only a temporary measure to allow for the installation of the tunnel. The permanent walls and stone backfill will be constructed at the ends of the tunnel and are a more permanent structure for the rail embankment. You may have saw the rods that were used to tie the sheets together from one side of the tracks to the other. Again, these members are not designed as a long term structure for supporting the embankment. 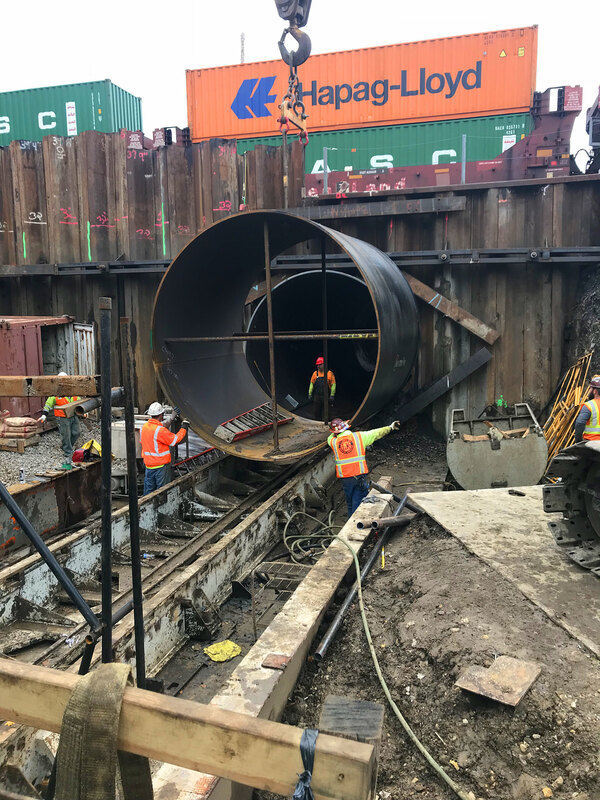 By removing the temporary sheets and rods, the loads will be transferred to the stone and new walls while the contractor will be monitoring the tracks for any vertical or horizontal movement. If it occurs, the railroad will come in and re-set the tracks. Well, the removal of the sidewalk from the original tunnel will benefit all drivers with a wider lane. While I believe that most of the GEVFD vehicles could go through it was a "tight fit". The pedestrians (including headphone wearing Hilltoppers) being separated from the vehicular traffic is also a good thing. Since an under/over pass in the CBD is unlikely any time soon, this was a nice upgrade. all good points, but still doesn't answer my question. I'm wondering what the cost benefit ratio looks like.